One upon a time there was a pastry crust that longed to become a savory pie, so tired was she of constantly enduring the fleeting, albeit fanciful, forays into fruit, custard, cream, and chocolate creations. There was something slightly unstable about these saccharine concoctions – something a little too emotionally raw, a little too naive. She had a feeling the world had a whole lot more to offer than all that cinnamon and sugar fairytale hype. And in that respect, our hopeful little pastry crust could not have been more correct. As a first attempt at a savory pie in a long, long time, this one has lived up to every expectation I immediately harbored upon glimpsing this charming pie and its accompanying recipe on a newly-discovered kindred pie blog, For Your Pies Only (thanks to which I have had Sheena Easton on perma-repeat in my head for the past 5 days). Unfortunately, the photo above is the only proof this pie ever existed. It was baked and whisked off to be sold to hungry attendees of an art and music show on Saturday evening. Looks as if you’ll have to take my word for it that this pie is a keeper, and it certainly is. I added fresh thyme as a last-minute addendum to the recipe, for the sole reason that I had some in the fridge that needed to be used, and quickly – and was pleased with the subtle contribution it made to the comfort flavors of apple, sausage, and brown mustard. I would also like to note that I baked a vegan version of this soulful pie, swapping out Niman pork links for Tofurky Italian sausage and using a vegan crust rather than the buttery kind. It, too, was exceptionally filling and delicious. Heat oven to 400° F. Roll out bottom crust and place in pie pan. Prick several times with a fork, line with tinfoil and fill with pie weights (or beans or rice). Partially prebake the bottom crust for 15 minutes. Reduce the oven temp. to 375 and remove the tinfoil. If the sides have started to fall, take a spoon and gently press them back into place. Continue to bake at 375 for another 7 minutes. Set aside to cool. Trim the leeks so you are left only with the white portion at the bottom. Rinse well, since dirt can get between the layers. Cut in half and then slice into thin pieces. Set aside to dry. Fry the sausage in a large frying pan until browned all over. Remove from pan leaving as much fat (oil) behind as you can, and set aside. Remove most of the fat from the pan (leaving it only slightly oiled). Put the leeks in the pan and soften over a low to medium heat for 8-10 minutes. Add the peeled apple slices and cook for another minute. In a separate bowl, whisk together the stock, flour, thyme and mustard. Pour the mixture into the leeks and stir until completely covered. Cook until bubbling and thickening, for about 2 minutes. Add the sausage and completely mix together. Gently pour the entire mixture into the bottom crust. Roll out the top crust and cover, cutting holes to vent. Brush the top with milk or egg and place in the oven on the center rack. Bake for 25-30 minutes at 375 or until golden brown. Take out of the oven and let cool for 10-15 minutes before serving. 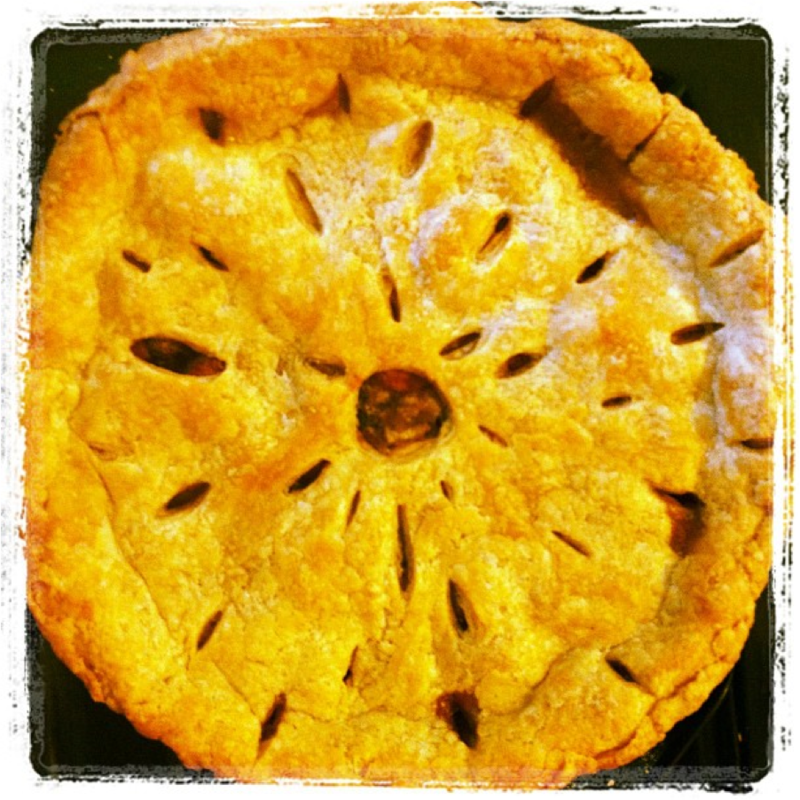 This entry was posted in Pie, Vegan and tagged apple, leek, pie, sausage, savory, thyme, vegan. Bookmark the permalink.